Kali Mar 6x, plastic phial of Hahnemann's biochemic medicine, one of a selection of drugs and related material from India, 1975-1980. 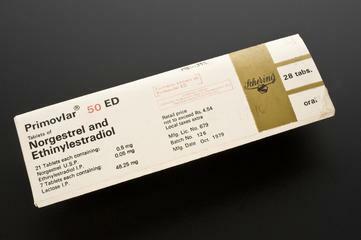 Blister pact with six tablets of Avil 25, pheniramine maleate by Hoechst Pharmaceuticals Ltd., one of a selection of drugs and related material from India, 1975-1980. China, a glass phial of homeopathic medicine by Bhandari Store, New Delhi, India for acidity. One of a selection of drugs and related material from India, 1975-1980. Ferr Phos 6x, plastic phial of Hahnemann's biochemic medicine, one of a selection of drugs and related material from India, 1975-1980. Calcarea Fluor., a glass phial of homeopathic medicine by Bhandari Store, New Delhi, India for lumbago. One of a selection of drugs and related material from India, 1975-1980. 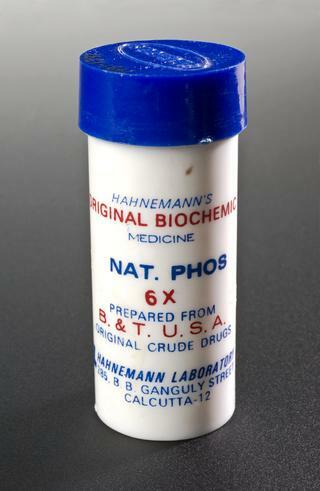 Mag Phos 6x, plastic phial of Hahnemann's biochemic medicine, one of a selection of drugs and related material from India, 1975-1980. Calc Fluor 6x, plastic phial of Hahnemann's biochemic medicine, one of a selection of drugs and related material from India, 1975-1980. Nat -Mur 6x, plastic phial of Hahnemann's biochemic medicine, one of a selection of drugs and related material from India, 1975-1980. Kali Phos 6x, plastic phial of Hahnemann's biochemic medicine, one of a selection of drugs and related material from India, 1975-1980. Apis Mel., a glass phial with cork stopper of homeopathic medicine by Bhandari Store, New Delhi, India for whitlow. One of a selection of drugs and related material from India, 1975-1980. Saptamritloh an Ayurveda medicine for eye infections (A blend of seven ingredients). One of a selection of drugs and related material from India, 1975-1980. Madhumeh an Ayurveda medicine for diabetes (drug has all the metals commonly used in Ayurveda except gold). One of a selection of drugs and related material from India, 1975-1980. Kali Sulph 6x, plastic phial of Hahnemann's biochemic medicine, one of a selection of drugs and related material from India, 1975-1980. Pulsatilla, a glass phial of homeopathic medicine by Bhandari Store, New Delhi, India for a Cough. 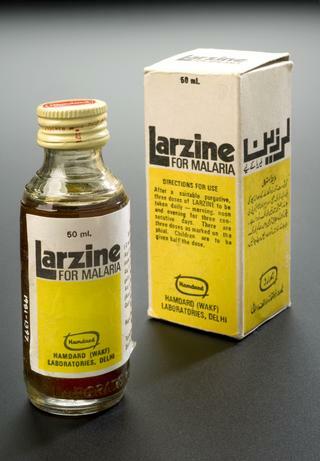 One of a selection of drugs and related material from India, 1975-1980. Ammonium Carb., a glass phial of homeopathic medicine by Bhandari Store, New Delhi, India for Chronic Bronchitis, one of a selection of drugs and related material from India, 1975-1980. Capsicum, a glass phial of homeopathic medicine by Bhandari Store, New Delhi, India for dysentery. One of a selection of drugs and related material from India, 1975-1980. Rhus Tox, a glass phial of homeopathic medicine by Bhandari Store, New Delhi, India for influenza. One of a selection of drugs and related material from India, 1975-1980. Kreosote, a glass phial of homeopathic medicine by Bhandari Store, New Delhi, India for toothache. One of a selection of drugs and related material from India, 1975-1980. Kali Mur, a glass phial of homeopathic medicine by Bhandari Store, New Delhi, India for tonsillitis. One of a selection of drugs and related material from India, 1975-1980. Calc Phos 6x, plastic phial of Hahnemann's biochemic medicine, one of a selection of drugs and related material from India, 1975-1980. Chitrakadi bati an Ayurveda medicine for dysentery, one of a selection of drugs and related material from India, 1975-1980. Blister pack of 10 'Vimgran' tablets (2 of 3 blister packs absent) in cardboard carton by Sarabhai Chemicals, one of a selection of drugs and related material from India, 1975-1980. Calc Sulph 6x, plastic phial of Hahnemann's biochemic medicine, one of a selection of drugs and related material from India, 1975-1980. Iris Ver., a glass phial with cork stopper of homeopathic medicine by Bhandari Store, New Delhi, India for vomiting. One of a selection of drugs and related material from India, 1975-1980. Belladonna, a glass phial of homeopathic medicine by Bhandari Store, New Delhi, India for acute Bronchitis. One of a selection of drugs and related material from India, 1975-1980. Blister pack with ten tablets of Brufen, Ibuprofen Tablets (anti-inflamatory), The Boots Company (India). One of a selection of drugs and related material from India, 1975-1980. Vatavikar an Ayurveda medicine for arthritis, composed of the popularly used Arogyavardhin (the small pill) and Yograz guggul (the larger pill). One of a selection of drugs and related material from India, 1975-1980. Mamira Succus, a glass phial of homeopathic medicine by Bhandari Store, New Delhi in India, for eye infections. 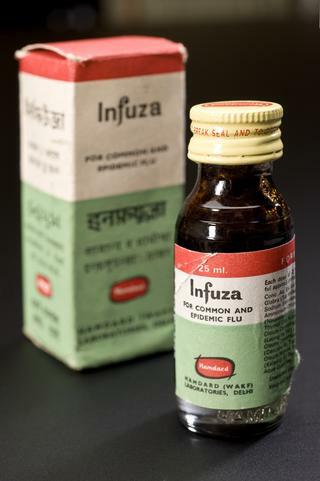 One of a selection of drugs and related material from India, 1975-1980.